Wooden sculpture is a classic, time-tested. This is a modern solution for the interior of a country house or restaurant, pub. 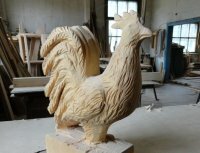 Making a wooden sculpture to order will allow you to originally arrange the local area, because a wooden carved sculpture is always a good and memorable element in landscape design. Differ in richness of texture and beauty of natural wood. Durable, resistant to different weather conditions. Differ in a huge variety of styles and manufacturing techniques. 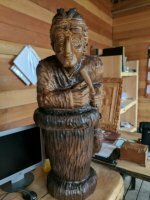 An opportunity to order a sculpture of any size and subject. Exclusive interior and street decoration. Modern wooden sculpture can be performed in different styles: from intentionally coarse chopped technology to elegant, sophisticated forms. Original wooden sculptures of a chainsaw. They are traditionally voluminous, impressive sizes. Attract attention precisely because of its massiveness. The tree does not limit the masters in the choice of subjects. 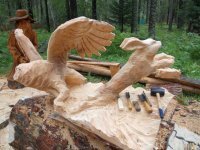 Customers can order wooden sculptures of animals, humans, women. This can be an original gift for your beloved wife for an anniversary or making a sculpture in the spirit of an institution. For example, in many restaurants and country residences animals are mentioned in the names. You can order a sculpture of a bear, fox, elk, boar or other symbol of your institutions. 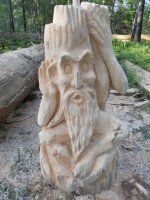 Wooden garden sculpture is one of the activities of our company, which specializes in the construction of houses made of cedar and larch logs. We produce high-quality and durable log buildings from 2006. For many years of experience, we have mastered all the modern logging techniques. Designing and creating log houses and baths from cedar, we select the best logs for construction. Having perfectly mastered the technology of working with a log house, the Bear Log Company laid the foundation for new directions. 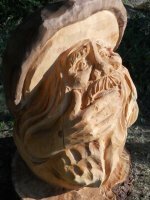 One of them - unique wooden sculptures for the garden. The price of wooden sculptures depends on their parameters and the complexity of execution, detail of the figure. We perform filigree carving on sculptures. The creation of sculptures exclusively from natural hardwood. Our masters are able to create a sculpture for any customer wishes. Buying sculptures from the manufacturer without intermediaries.